Sunday January 6th 1901 It was late when we got up and I was busy all forenoon getting dinner. Will and I went over to Charlie Hodges in the afternoon. I read in the evening. Mort here all day Monday January 7th 1901 Will began to haul the corn to Hill Siding from one side of the big crib. He had Mr Henly with his team and another man to drive one of ours. I was busy with the cooking a great part of the day. 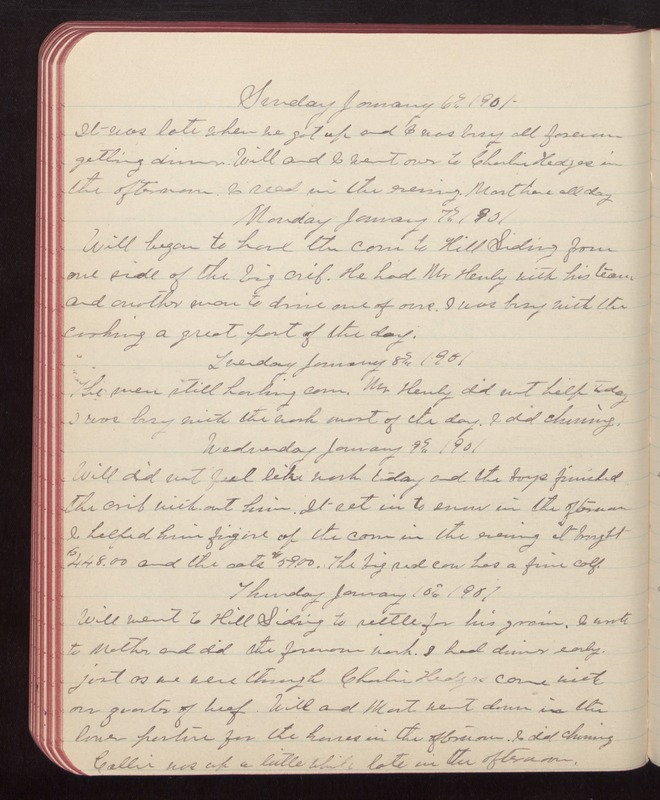 Tuesday January 8th 1901 The men still hauling corn. Mr Henly did not help today I was busy with the work most of the day. I did churning. Wednesday January 9th 1901 Will did not feel like work today and the boys finished the crib with-out him. It set in to snow in the afternoon I helped him figure up the corn in the evening it brought $448.00 and the oats $59.00. The big red cow has a fine calf. Thursday January 10th 1901 Will went to Hill Siding to settle for his grain. I wrote to Mother and did the forenoon work. I had dinner early. just as we were through Charlie Hodges came with our quarter of beef. Will and Mort went down in the lower pasture for the horses in the afternoon. I did churning Callie was up a little while late in the afternoon.